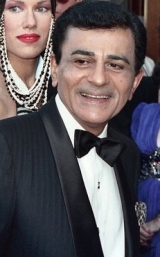 I first met Casey Kasem at an Arab American gathering in Washington, D.C. My book, The TV Arab (1984), had just been released; when I signed and gave him a copy he quickly responded with a warm "thank you, Jack" and a smile, followed by a huge hug. From that moment on we became friends, true friends. Each and every time I published a book on the stereotype, Casey was there; he would purchase dozens of copies, giving them to colleagues and media personnel. The professional and the professor -- we were a team. Several times, we spoke on radio and/or appeared on TV to contest and eradicate harmful images. Together, at Mickey Mouse headquarters in Burbank we helped viewed the racist cartoon Mickey in Arabia (1932), and he also helped convince Disney to delete the harmful opening lyrics of Aladdin (1992). We also served as script consultants on Hanna-Barbera's TV movie Scooby Doo in Arabian Nights (1998). Yet, the quiet times we shared as friends remain the most memorable. I recall one evening, especially, at his home; he had this great popcorn machine and popped enough corn for an army; we ate every kernel while watching the Lakers play; Casey loved the Lakers. Often, we would meet at the Lebanese restaurant, Carnival, with our friend Don Bustany. Here, he would try to convince me to become a vegetarian. We would go on and on about how best to counter the stereotype, our Lebanese Detroit/Pittsburgh roots, and then share thoughts about our youth -- what it was like to be sons of immigrants, to work in a steel mill or grocery story. When together in the public arena he would always express humility and kindness to one and all. He was a man of peace who was a champion for justice in the Middle East. Casey loved his children; he was also very proud of his heritage. He will be remembered as one of God's most gentle beings; as a man who sincerely cared about others, who always kept his feet firmly planted on the ground. This is why his tender soul is now rests in its rightful place, among the brightest stars in our universe. Kasem photo by Alan Light, 1988. Many thanks for this. I've linked to it on the Middle East Institute blog.